President Xi Jinping pledged another $60 bln to the continent while warning against the kind of binges that have led countries to default. 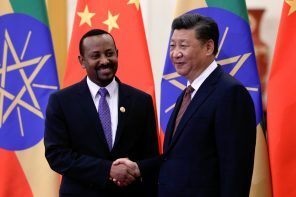 Yet Africa shows no sign of restraint, and China’s lending remains opaque. Accusations of debt-trap diplomacy are likely to linger. The Chinese investor is upping its stake in lender BCP from 16.7 pct to 30 pct. Fosun is supposed to be deleveraging, and the Portuguese bank still won’t be lavishly capitalised. Still, with BCP trading at 0.2 times book, the Shanghai-based group can argue it is not overpaying. The Spanish bank’s bid for BPI will proceed after the latter removed a voting cap on CaixaBank's 45 percent stake. Another issue - BPI’s problematic exposure to Angola - may be resolved, albeit by ceding control in the African unit. At least CaixaBank has a free hand in Portugal. The Spanish bank has launched a second offer for its Portuguese peer at a lower price. Angolan investor Isabel dos Santos used a voting cap to block the last one, but the state may now scrap this. Despite a hit to capital, Caixa now has a light at the end of the tunnel. The Spanish bank has reached a deal with Angolan investor Isabel dos Santos that could see BPI cut its exposure to the African state. It’s the key to a Caixa bid for all of BPI. Even better, the Spaniards may be able to take control of their Portuguese rival for a lower price. Unlike, say, Venezuela or Mexico, the African nation has doubled oil output since 2001. That has boosted GDP per capita, but corruption and human rights abuses are holding the economy back. Sadly for Angolans, the likely re-election of the 33-year president won’t change that. Despite some tough regimes and far smaller reserves, Africa is set to overtake Latin America’s crude output this year. The unlikely reversal reflects investor-friendly approaches in the likes of Angola. It’s also the clearest sign yet of how misguided the Latin region’s course is. The U.S. oil giant’s $2 bln deal with Angola and Congo is a diplomatic coup. It unites two of the largest producers on a continent gushing with resource disputes. With Africa supplying a quarter of the world’s new oil, anything that could help resolve other clashes is welcome.